While visiting friends in Austin, Texas, we took a day trip to San Antonio to check out The Alamo and the famous Riverwalk. What a gorgeous day. My friends lived in San Antonio for a short while, forty years ago. 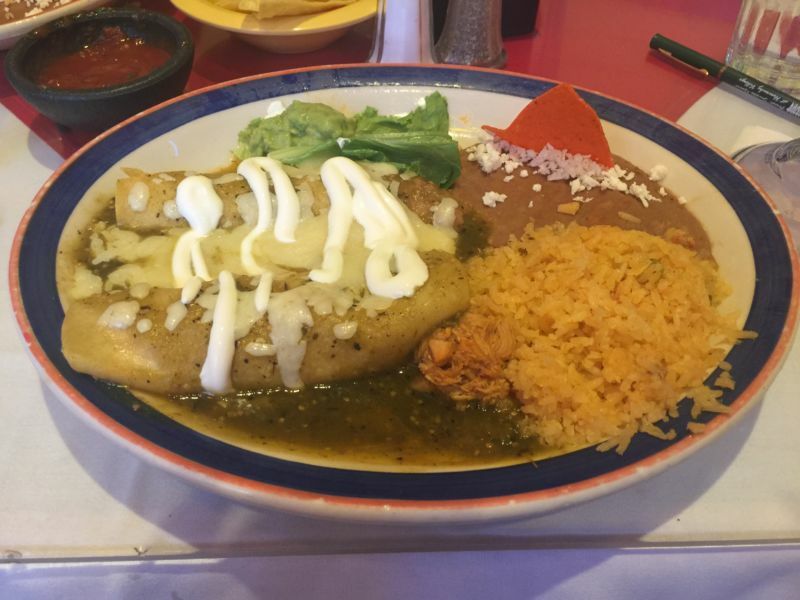 They were reminiscing about a great restaurant, Mi Tierra, and their green chicken enchiladas. Before I knew it, we were in the car, headed to San Antonio to see if this place was as good as they remembered. My friends described the restaurant as a little hole in the wall type of establishment. I was expecting a run down shack on the edge of town. This place wasn’t at all what I had imagined. 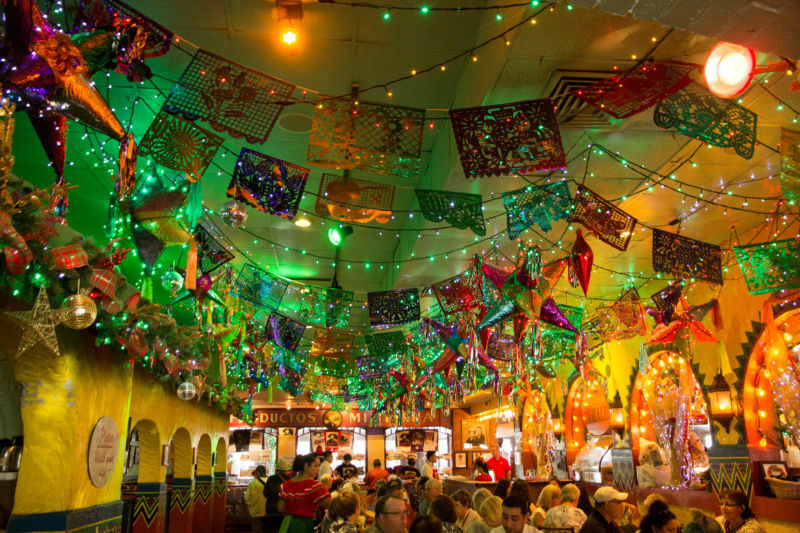 It was a large, multi-roomed restaurant full of bright decor and traditionally costumed waitresses and waiters. 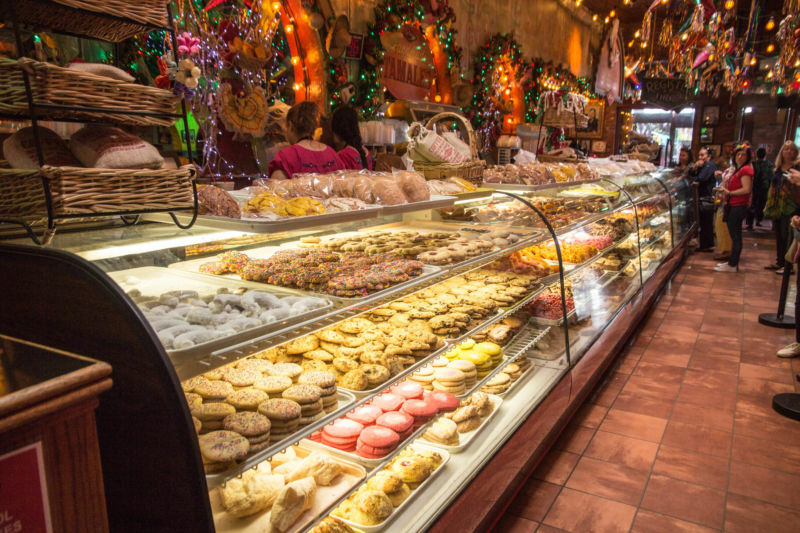 There was an enormous glass case in the front filled with beautiful pastries and desserts that you can buy, along with traditionally hand-rolled tamales and other treats. When we were seated a Mariachi group started playing. They were excellent and their music really added to the ambiance of the place. Our waiter was efficient and friendly. Waters and menus were brought immediately. Looking over the drinks menu, my girlfriend and I decided to order a Texas style Margarita with a Sangria Swirl. Let me just tell you now that it was every bit as yummy as that sounds. One sip and I was in love. 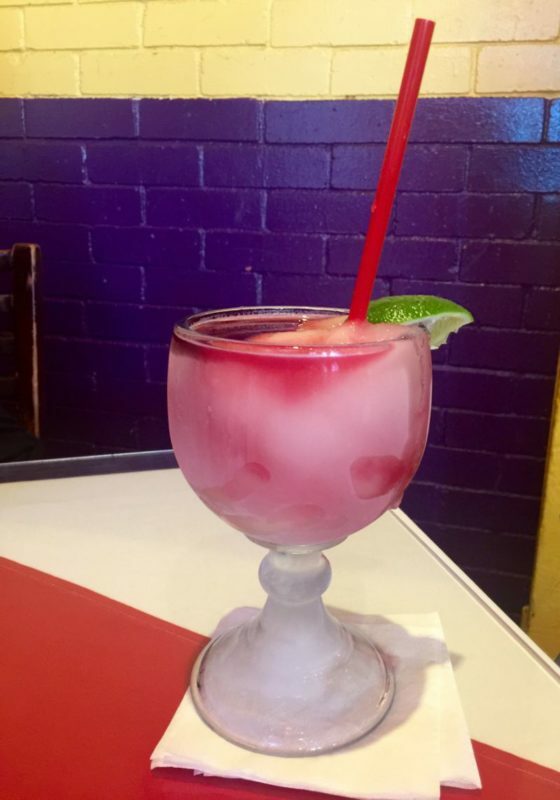 A perfect, tart, frozen Margarita with a fruity Sangria swirl. I wonder if The Brit can make these for me at home? I could see these becoming a favorite. Warm, fresh, perfectly salted chips and salsa were brought to our table. The salsa was outstanding. Great tomato, garlic, cilantro, and onion flavors, without being overly spicy; wonderful! As I was inhaling the chips and salsa, an amazing smell wafted through the air. I looked behind me; it was a huge plate of fajitas. It looked so good; I couldn’t wait for my food to arrive. Finally, our food arrived. A beautiful plate; stuffed full of stewed shredded chicken in a surprisingly sweet tomato sauce, contrasted by an amazing vinegar based tomatillo sauce. The enchiladas were awesome; not at all spicy, full of rich flavor and topped with sour cream. I could see why this place was so popular. The fluffy and delicious Mexican rice and the refried beans, topped with cojia cheese, rounded out the plate. It was so hearty and filling I couldn’t even manage my second enchilada. The only thing I found disappointing was the guacamole, which whilst it tasted fresh, didn’t have much flavor or zip. I saved the best for last: the warm, fresh flour tortillas that were served to us. Seriously, it was all I could do to not grab the tortilla warmer and gobble them all down myself. They were outstanding; I could eat those all day long. Even though I was stuffed to the gills and had to roll myself out of the restaurant before I could order more food, I did manage to drink the entire huge Margarita with a big smile. This place is awesome. If you find yourself in San Antonio, do yourself a favor and visit this great little restaurant. Pingback: San Antonio River Walk and the Alamo. A taste of old and new Texas.